Home / Books / The Invisible Committee: Power is Logistic. Block Everything! Taken from To Our Friends – By The Invisible Committee. Occupation of the Kasbah in Tunis and of the Syntagma Square in Athens, siege of Westminster in London during the student movement of 2011, encirclement of the parliament in Madrid on September 25, 2012 or in Barcelona on June 15, 2011, riots all around the Chamber of Deputies in Rome on December 14, 2010, attempt on October 15, 2011 in Lisbon to invade the Assembleia da Republica, burning of the Bosnian presidential residence in February of 2014: the places of institutional power exert a magnetic attraction on revolutionaries. But when the insurgents manage to penetrate parliaments, presidential palaces, and other headquarters of institutions, as in Ukraine, in Libya or in Wisconsin, it’s only to discover empty places, that is, empty of power, and furnished without any taste. It’s not to prevent the “people” from “taking power” that they are so fiercely kept from invading such places, but to prevent them from realizing that power no longer resides in the institutions. There are only deserted temples there, decommissioned fortresses, nothing but stage sets—real traps for revolutionaries. The popular impulse to rush onto the stage to find out what is happening in the wings is bound to be disappointed. If they got inside, even the most fervent conspiracy freaks would find nothing arcane there; the truth is that power is simply no longer that theatrical reality to which modernity accustomed us. Yet the truth about the actual localization of power is not hidden at all; it’s only we who refuse to see it for fear of having our comfortable certainties doused with cold water. For confirmation of this, one only has to look for a moment at the banknotes issued by the European Union. Neither the Marxists nor the neoclassical economists have ever been able to admit that money is not essentially an economic instrument but a political reality. We have never seen any money that was not attached to a political order capable of backing it. That is also why the bills of the different countries bear the personal images of emperors and great statesmen, of founding fathers or personified allegories of the nation. But what is it that appears on euro banknotes? Not human figures, not emblems of a personal sovereignty, but bridges, aqueducts, arches—pieces of impersonal architecture, cold as stone. As to the truth about the present nature of power, every European has a printed exemplar of it in their pocket. It can be stated in this way: power now resides in the infrastructures of this world. Contemporary power is of an architectural and impersonal, and not a representative or personal, nature. Traditional power was representative: the pope was the representation of Christ on Earth, the king, of God, the President, of the people, and the General Secretary of the Party, of the proletariat. This whole personal politics is dead, and that is why the small number of orators that survive on the surface of the globe amuse more than they govern. The cast of politicians is actually composed of clowns with varying degrees of talent—whence the phenomenal success of the wretched Beppe Grillo in Italy or the sinister Dieudonné in France. All in all, at least they know how to entertain you, which is their profession of course. So, in addition to stating the obvious, reproaching politicians for “not representing us” only maintains a nostalgia. The politicians are not there for that, they’re there to distract us, since power is elsewhere. And this correct intuition is what turns nutty in all the contemporary conspiracisms. Power is indeed somewhere else, somewhere other than in the institutions, but it’s not hidden for all that. Or if it is, it’s hidden like Poe’s “purloined letter.” No one sees it because everyone has it in plain sight, all the time—in the form of a high-voltage line, a freeway, a traffic circle, a supermarket, or a computer program. And if it is, it’s hidden like a sewage system, an undersea cable, a fiber optic line running the length of a railway, or a data center in the middle of a forest. Power is the very organization of this world, this engineered, configured, purposedworld. That is the secret, and it’s that there isn’t one. Power is now immanent in life as it is technologically organized and commodified. It has the neutral appearance of facilities or of Google’s blank page. Whoever determines the organization of space, whoever governs the social environments and atmospheres, whoever administers things, whoever manages the accesses—governs men. Contemporary power has made itself the heir, on the one hand, of the old science of policing, which consists in looking after “the well-being and security of the citizens,” and, on the other, of the logistic science of militaries, the “art of moving armies,” having become an art of maintaining communication networks and ensuring strategic mobility. Absorbed in our language-bound conception of the public thing, of politics, we have continued debating while the real decisions were being implemented right before our eyes. Contemporary laws are written in steel structures and not with words. All the citizens’ indignation can only end up butting its dazed forehead against the reinforced concrete of this world. The great merit of the struggle against the TAV in Italy is in having firmly grasped all that is involved politically in a simple public works project. Symmetrically, this is something that no politician can acknowledge. Like that Bersani who snapped back one day at the NO TAVmilitants: “After all, we’re talking here about a train line, not a bomber.” But “a construction site is worth a battalion,” in the estimation of Marshal Lyautey, who had no rival in the business of “pacifying” the colonies. If struggles against big infrastructure projects are multiplying all over the world, from Romania to Brazil, it’s because this intuition itself is becoming widespread. Anyone who means to undertake anything whatsoever against the existing world must start from there: the real power structure is the material, technological, physical organization of this world. Government is no longer in the government. The “power vacuum” that lasted in Belgium for more than a year is a clear example in point. The country was able to function with no government, elected representatives, parliament, political debate, or electoral issues, without any part of its normal operation being affected. Same thing in Italy, which has been going from “technical government” to “technical government” for years now, and it doesn’t bother anyone that this expression goes back to the Manifesto-program of the Futurist Party of 1918, which incubated the first fascists. Power, henceforth, is the very order of things, and the police charged with defending it. It’s not simple to think about a power that consists in infrastructures, in the means to make them function, to control them and to build them. How do we contest an order that isn’t articulated in language, that is constructed step by step and wordlessly? An order that is embodied in the very objects of everyday life. An order whose political constitution is its material constitution. An order that is revealed less in the President’s words than in the silence of optimal performance. In the age when power manifested itself through edicts, laws, and regulations, it was vulnerable to critical attack. But there’s no criticizing a wall, one destroys it or tags it. A government that arranges life through its instruments and its layouts, whose statements take the form of a street lined with traffic cones and surveilled by overhead cameras, may only invite a destruction that is wordless itself. Aggression against the setting of everyday life has become sacrilegious, consequently; it’s something like violating its constitution. Indiscriminate smashing in urban riots expresses both an awareness of this state of things, and a relative powerlessness in the face of it. The mute and unquestionable order which the existence of a bus shelter embodies will not lie shattered on the ground, unfortunately, once the shelter is demolished. The broken windows theory will still stand after all the shop windows have been smashed. All the hypocritical proclamations about the sacred character of the “environment,” the holy crusade for its defense, can only be understood in light of this mutation: power has become environmental itself, has merged into the surroundings. It is power that we’re asked to defend in all the official appeals to “preserve the environment,” and not the little fish. 2. On the Difference Between Organizing and Organizing Oneself. Everyday life has not always been organized. For that to be accomplished, it was necessary first to dismantle life, starting with the city. Life and the city have been broken down into functions, corresponding to “social needs.” The office district, the factory district, the residential district, the spaces for relaxation, the entertainment district, the place where one eats, the place where one works, the place where one cruises, and the car or bus for tying all that together are the result of a prolonged reconfiguration of life that devastated every form of life. It was carried out methodically, for more than a century, by a whole caste of organizers, a whole grey armada of managers. Life and humanity were dissected into a set of needs; then a synthesis of these elements was organized. It doesn’t really matter whether this synthesis was given the name of “socialist planning” or “market planning.” It doesn’t really matter that it resulted in the failure of new towns or the success of trendy districts. The outcome is the same: a desert and existential anemia. Nothing is left of a form of life once it has been partitioned into organs. Conversely, this explains the palpable joy that overflowed the occupied squares of the Puerta del Sol, Tahrir, Gezi or the attraction exerted, despite the infernal muds of the Nantes countryside, by the land occupation at Notre-Dame-des-Landes. It is the joy that attaches to every commune. Suddenly, life ceases being sliced up into connected segments. Sleeping, fighting, eating, taking care of oneself, partying, conspiring, discussing all belong to the same vital movement. Not everything is organized, everything organizes itself. The difference is meaningful. One requires management, the other attention—dispositions that are incompatible in every respect. Referring to the Aymara uprisings in Bolivia at the beginning of the 2000s, a Uruguayan activist, Raúl Zibechi, writes: “In these movements, organization is not separate from daily life. In insurrectionary action it is daily life itself that is deployed.” He observes that in the neighborhoods of El Alto, in 2003, “a communal ethos replaced the old trade-union ethos.” Very cool, that, because it clarifies what a struggle against infrastructural power consists in. Say infrastructure and you’re saying that life has been detached from its conditions. That conditions have keen placed on life. That life now depends on factors out of its control, that it has lost its footing. Infrastructures organize a life without a world, suspended, expendable, at the mercy of whoever is managing them. Metropolitan nihilism is only a brash way of not admitting this to oneself. Contrariwise, Raúl’s statement also indicates what is being sought in the experiments that are underway in a large number of neighborhoods and villages throughout the world, and the inevitable pitfalls. Not a return to earth but a reinhabiting of earth. What gives insurrections their punch, and their ability to damage the adversary’s infrastructure in a sustained way, is precisely their level of self-organization of communal life. That one of the first reflexes of Occupy Wall Street was to go block the Brooklyn Bridge or that the Oakland Commune along with several thousand people undertook to paralyze the city’s port during the general strike of December 12, 2011, are evidence of the intuitive link between self-organization and blockage. The fragility of the self-organization that barely took shape in the occupations did not allow these attempts to be pushed further, apparently. By contrast, Tahrir and Taksim squares are central hubs of automobile circulation in Cairo and Istanbul. To block those flows was to open up the situation. The occupation was immediately a blockade. Hence its ability to throw the reign of normality out of joint in a whole metropolis. At a completely different level, one can’t help but draw a connection between the fact that the Zapatistas are currently proposing to link together twenty-nine defensive struggles against mining, highway, power-plant, and dam projects involving different indigenous peoples all over Mexico, and the fact that they themselves have spent the past fifteen years establishing their autonomy vis-à-vis the federal and economic powers. A 2006 sign posted by the French movement against the “first employment contract,” the CPE, said: “It’s through flows that this world is maintained. 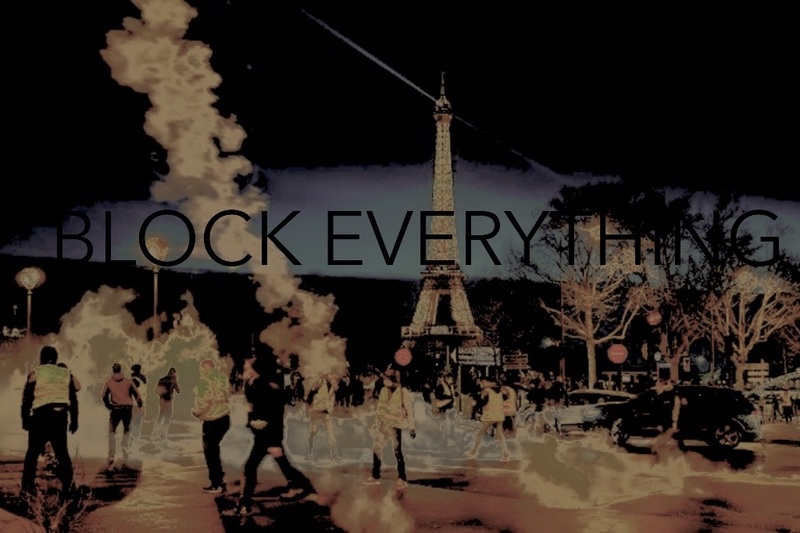 Block everything!” This rallying cry, propagated by a minority of a movement that was itself minoritarian, albeit “victorious,” has enjoyed a successful run since then. In 2009, the movement against “pwofitasyon,” which paralyzed all of Guadaloupe, used it in a big way. And we have seen the practice of blockading, during the French movement against retirement restructuring, become the staple tactic of struggle, applied uniformly to a fuel depot, a mall, a train station, or a production site. Now, there is something, surely, that reveals a certain state of the world. The fact that this movement against the overhaul of retirement centered around the blockading of refineries is not politically negligible. At the end of the seventies, refineries became the vanguard of what were called “process industries,” “flux” industries. It can be said that refinery operation has served as the model for the restructuring of most factories since that time. Moreover, one should not talk about factories any longer, but about sites, production sites. The difference between the factory and the site is that a factory is a concentration of workers, technical know-how, primary materials, stocks, whereas the site is only a node on a map of productive flows. Their only shared trait being that what comes out of both, compared with what went in, has undergone a certain transformation. The refinery is that place where the relation between labor and production was first overturned. There the worker, or rather the operator, doesn’t even have the job of maintaining and repairing the machines, which is generally assigned to temporary workers, but simply of bringing a certain attention, a certain vigilance to bear on a totally automated production process. There may be an indicator light that switches on when it shouldn’t, an abnormal gurgling in a pipe, smoke escaping where there shouldn’t be any, or that doesn’t look the way it should. The refinery worker is a kind of monitor of machines, an idle figure, full of nervous concentration. And this is the trend now in most sectors of industry in the West. The classic worker could be gloriously imagined as the Producer; here the relationship between labour and production is simply inverted. There is work only when production stops, when a malfunction gets in the way. The Marxists can stick to their day jobs: the process of commodity valorization, from extraction to the pump, coincides with the process of circulation, which itself coincides with the process of production. It depends in real time on the final fluctuations of the market. Saying that the value of the commodity crystallizes the labor time of the worker was a political operation that was as fruitful as it was fallacious. In refineries just as in any completely automated factory, it has become a mark of hurtful irony. Give China ten more years, ten years of workers’ demands, and it will be the same situation there. Obviously, it’s not insignificant that refinery workers have long been among the best paid industrial workers, and that it was in this sector, at least in France, that what is euphemistically called the “fluidification of social relations,” union relations in particular, was first tried out. During the movement against retirement reform, most of France’s fuel depots were blockaded not by their five workers, but by teachers, students, drivers, railroad men, postal employees, unemployed people, and high school students. This wasn’t because those industry workers don’t have the right. It’s simply that in a world where the organization of production is decentralized, fluid, and largely automated, where each machine is now but a link in an integrated system of machines that subsume it, and where this system-world of machines, of machines producing machines, tends to be unified cybernetically, each particular flow is a moment of the overall reproduction of capital’s society. There is no longer a “sphere of reproduction” of labor power and social relations distinct from the sphere of production, which itself is no longer a sphere, but rather the web of the world with all its relations. To physically attack these flows, at any point, is therefore to politically attack the system as a whole. If the subject of the strike was the working class, the subject of the blockade is whoever. It’s anyone at all, anyone who takes a stand against the existing organization of the world. It’s generally when they reach their maximum degree of sophistication that civilizations fall apart. Every production chain is now reaching such a level of specialization through so many intermediaries that if one of them disappeared that would be enough to paralyze, or even destroy, the whole chain. Three years ago, Honda factories in Japan went through the longest period of layoffs since the sixties simply because the supplier of a particular computer chip had disappeared in the earthquake of March, 2011 and no one else could produce it. In this blockading craze that now accompanies every movement of any size, we cannot help but read a reversal of our relation to time. We look toward the future in the same way Walter Benjamin’s Angel of History looked toward the past. “Where we see the appearance of a chain of events, he sees one single catastrophe, which unceasingly piles rubble on top of rubble and hurls it before his feet.” The time that’s passing is no longer seen as anything but a slow progression towards an end that will likely be horrendous. Every coming decade looks like another step closer to the climate chaos that everyone has understood to be the truth lurking in the insipid phrase “climate warming.” The heavy metals will continue, day by day, to accumulate in the food chain, along with radioactive nuclides and all the other invisible but fatal pollutants. So every attempt to block the global system, every movement, every revolt, every uprising should be seen as a vertical attempt to stop time, delay the catastrophe and begin to branch off in a less fatal direction. It’s not the weakness of our struggles that explains the disappearance of any revolutionary perspective; it’s the absence of any credible revolutionary perspective that explains the weakness of our struggles. Obsessed as we are with a political idea of the revolution, we have neglected its technical dimension. A revolutionary perspective no longer focuses on an institutional reorganization of society, but on the technical configuration of worlds. As such, it is a line traced in the present, not an image floating in the future. If we want to regain a perspective, we have to couple the vague awareness that this world can’t last with the desire to build a better one. For if this world keeps going, it’s largely owing to everyone’s material dependence on the smooth general operation of the social machine for their survival. We need to have a technical knowledge of the organization of this world at our disposal; a knowledge that enables us both to neutralize the dominant structures and to secure the necessary time for organizing a material and political disengagement from the general course of the catastrophe, a disengagement not haunted by the specter of extreme poverty, by the urgency of survival. To say that plainly: so long as we can’t do without nuclear power plants and dismantling them remains a business for people who want them to last forever, aspiring to abolish the state will continue to draw smiles; so long as the prospect of a popular uprising will signify a guaranteed fall into scarcity, of health care, food, or energy, there will be no strong mass movement. In other words: we need to resume a meticulous effort of investigation. We need to go look in every sector, in all the territories we inhabit, for those who possess strategic technical knowledge. Only on this basis will movements truly dare to “block everything.” Only on this basis will the passion for experimenting towards another life be liberated, a largely technical passion that is the obverse, as it were, of everyone’s state of technological dependence. This process of knowledge accumulation, of establishing collusions in every domain, is a prerequisite for a serious and massive return of the revolutionary question. “The workers’ movement wasn’t defeated by capitalism, but by democracy,” said Mario Tronti. It was also defeated by failing to appropriate the substance of working-class power. What defines the worker is not his exploitation by a boss, which he shares with all other employees. What distinguishes him in a positive sense is his embodied technical mastery of a particular world of production. There is a competence in this that is scientific and popular at the same time, a passionate knowledge that constituted the particular wealth of the working world before capital, realizing the danger contained there and having first extracted all that knowledge, decided to turn workers into operators, monitors, and custodians of machines. But even there, the workers’ power remains: someone who knows how to make a system operate also knows how to sabotage it in an effective way. But no one can individually master the set of techniques that enable the current system to reproduce itself. Only a collective force can do that. This is exactly what it means to construct a revolutionary force today: linking together all the worlds and all the revolutionarily necessary techniques, shaping these into a historical force and not a system of government. The failure of the French struggle against retirement restructuring in the autumn of 2010 taught a bitter lesson on this subject. If the CGT had control of the whole struggle, it was due to our inadequacy in the technical sphere. All the union needed to do was turn the blockade of the refineries, where it was hegemonic, into the spearhead of the movement. That way it was free at any moment to signal the end of the game by reopening the refinery valves, thereby releasing all the pressure on the country. What the movement lacked at that point was precisely a minimal knowledge of the material functioning of that world, a knowledge scattered among some workers, concentrated in the egghead brains of a few engineers, and shared no doubt, on the opposing side, in some obscure military agency. If we had been able to cut off the police’s supply of teargas, or interrupt the televised propaganda for a day, or deprive the authorities of electricity, we can be sure that things would not have ended so pitifully. Moreover, it has to be concluded that the main political defeat of the movement was to have surrendered the strategic prerogative of deciding who would have gasoline and who would not to the State, with its requisitions at the prefectural level. “Nowadays if you want to get rid of someone, you go after his infrastructure,” writes an American academic, incisively. Since the Second World War, the American Air Force has been developing the idea of “infrastructure warfare,” seeing the most ordinary civil infrastructure as targets for bringing its opponents to their knees. This explains, in fact, why strategic infrastructure facilities are enveloped in a growing secrecy. For a revolutionary force there is no sense in its knowing how to block the opponent’s infrastructure if it can’t make such facilities operate for its benefit if there’s a need. Being able to destroy the technological system presupposes that one has tried out / implemented the techniques that make the system superfluous. Reinhabiting the earth means, to start with, no longer living in ignorance of the conditions of our existence. From To Our Friends – By The Invisible Committee.